Van Gaal and United were under pressure to produce after Monday's FA Cup quarter-final loss at home to Arsenal left them with a place in next season's Champions League as their only target. And they did so in style as a performance of pace and verve rarely seen this season ripped top-four rivals Spurs apart, especially in a first half where United raced into a three-goal lead. Marouane Fellaini and Michael Carrick effectively settled the contest with two early goals before captain Wayne Rooney added a third - complete with a self-mocking boxing knockout celebration after the publication of a video showing him being floored by Stoke City's Phil Bardsley in an impromptu bout in his kitchen. Phil Neville: "There were lots of positives for Manchester United to take away from their impressive win over Tottenham but the most pleasing thing for me was to see Marouane Fellaini get a standing ovation when he came off near the end." It was Spurs who had the glass jaw here as they were outclassed by United, who now stand only two points adrift of arch-rivals Manchester City, who are in second place behind leaders Chelsea. The pressure now moves back on to Liverpool, who face Swansea City at The Liberty Stadium on Monday night, before meeting United in a vital clash at Anfield next Sunday that could have such a bearing on the eventual top-four placings. This was the United their supporters have been waiting to see since Van Gaal replaced sacked David Moyes in the summer, full of high-tempo attacking intent, with the recalled Juan Mata delivering a virtuoso display that earned him a prolonged standing ovation from Old Trafford when he was substituted late on. It was much-needed after the FA Cup setback against Arsenal but was a painful reality check for Spurs, who are now six points off the top four and facing a renewed battle to fight their way into the Champions League positions. Wayne Rooney has now scored 14 goals in his last 14 Premier League appearances at Old Trafford. He has also bagged eight goals in his last nine league starts against Spurs. Mata was back in United's side in place of the suspended Angel Di Maria - and played his part in a scintillating first half that settled what was expected to be a tight contest. Carrick was also back and was instrumental as United went two up in the first 20 minutes, creating the opener for Fellaini and scoring the second himself. He demonstrated precision and composure to play in Fellaini, who scored with a low left-footed finish across Spurs keeper Hugo Lloris, who strangely attempted to save with his legs. Carrick then doubled United's lead with a neat header after Fellaini's power in the air caused more trouble in the area. The match was running away from Spurs at such a rate that coach Mauricio Pochettino made a tactical change after only 30 minutes when Mousa Dembele was introduced at the expense of Andros Townsend, although any number of his hapless colleagues could have been under threat. No tactical alterations could legislate for the errors and pathetic defending from Spurs that led to United's third, albeit a goal that was expertly taken by Rooney. 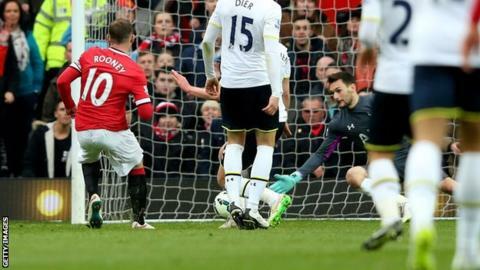 Nabil Bentaleb inexplicably gifted a pass to Rooney, who was almost ushered towards goal by a succession of Spurs defenders before beating Lloris with ease, throwing fake punches in the direction of United's celebrating supporters before collapsing dramatically to the floor. The game was won and the second half was little more than a procession, United's fans basking in the rare luxury of revelling in a comfortable win backed up by a high-quality performance to keep Van Gaal's side right in the hunt for the top four. Tottenham manager Mauricio Pochettino: "We are disappointed because our performance today was very poor and we have to analyse why. "After we conceded the first goal it seemed that the game was finished and we never found a way to damage Manchester United. We were never in the game." Tottenham's Andros Townsend was substituted after just 30 minutes. Match ends, Manchester United 3, Tottenham Hotspur 0. Second Half ends, Manchester United 3, Tottenham Hotspur 0. Attempt saved. Harry Kane (Tottenham Hotspur) right footed shot from the right side of the box is saved in the bottom right corner. Assisted by Erik Lamela with a through ball. Substitution, Manchester United. Rafael replaces Michael Carrick. Offside, Tottenham Hotspur. Danny Rose tries a through ball, but Emmanuel Adebayor is caught offside. Attempt blocked. Jan Vertonghen (Tottenham Hotspur) right footed shot from the centre of the box is blocked. Corner, Tottenham Hotspur. Conceded by Wayne Rooney. Substitution, Manchester United. Falcao replaces Marouane Fellaini. Substitution, Tottenham Hotspur. Emmanuel Adebayor replaces Nacer Chadli. Offside, Manchester United. Ashley Young tries a through ball, but Daley Blind is caught offside. Offside, Tottenham Hotspur. Eric Dier tries a through ball, but Erik Lamela is caught offside. Attempt missed. Ander Herrera (Manchester United) right footed shot from outside the box misses to the left. Assisted by Wayne Rooney. Offside, Manchester United. Michael Carrick tries a through ball, but Ander Herrera is caught offside. Attempt blocked. Kyle Walker (Tottenham Hotspur) right footed shot from outside the box is blocked. Nacer Chadli (Tottenham Hotspur) wins a free kick in the attacking half. Attempt missed. Ander Herrera (Manchester United) right footed shot from the right side of the box is close, but misses to the right. Attempt missed. Ryan Mason (Tottenham Hotspur) right footed shot from outside the box misses to the left. Assisted by Nacer Chadli. Attempt blocked. Daley Blind (Manchester United) left footed shot from outside the box is blocked. Assisted by Wayne Rooney.